Trek - O -Tel Hotel, Gauri Ghat, Lakeside, Pokhara, Nepal. 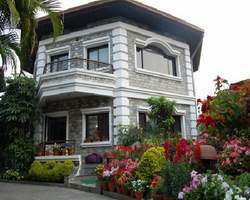 Quiet, away from traffic, yet next door to a myriad of shopping areas and restaurants, Trek-O-Tel located in the popular lakeside area of pokhara. Trek-O-Tel is within close proximity of various tourist services. Trek-O-Tel Hotel Pokhara, the newest three star hotel in lakeside Pokhara, is a compelling theatre to view the fabulous vistas of Phewa lake and Fishtail Mountain peaks. The luxury of this quiet lakeside retreat embraces travelers with the charm of a private residence. Trek-O-Tel Hotel Pokhara offers clean and elegant accommodation coupled with a genuine friendliness of a family run hotel. A three star hotel with 42 centrally air conditioned rooms with some windows facing the Fewa Lake & some facing the Annapurna Range along the Fishtail Mountain.